1. Have you ever had a special pet in your life? Will you tell us about it? 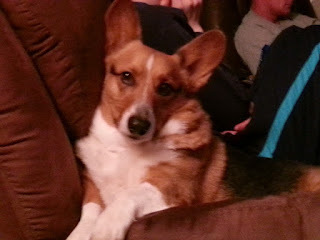 I have had a few pets in my life, the most special pet for me is my dog Mandy...she is a Pembroke Welsh Corgi and is currently 11 years old turning 12 in May. She does not have a lot of time left. She has a condition called Degenerative Myelopathy...basically she is slowly losing the use of her muscles. Her back legs do not work anymore, but she can still get around. Once things get into her front legs and affect her breathing, it will be the end, but we are not quite there yet. We got Mandy as a puppy, she slept with us until just a couple of years ago, she still sleeps in a bed right next to my side of the bed. Mandy always knows when something is wrong and stays close. She is really smart and I love her a lot. This is Mandy probably about 3 years ago. She looks the same, absolutely gorgeous! 2. Did you grow up with pets in your home? What did it teach you? I had a dog named Kai as a kid, but my mom made him live outside, I had a parakeet and it was cute. I did learn that I would NEVER make a dog live outside again in my lifetime. I do not want a pet to be penned up and have little interaction. 4. Sometimes a pet gets out and doesn't return for a few days. What do you think happens to them when they go on a walkabout? We did have a lab several years ago that refused to stay home...he would escape our yard and go out hunting animals..rabbits, etc. We learned later he ate the neighborhood cats too, he also played in a pond a lot. We had to give him to my husbands parents so he would stay put...they live on a farm. We tried putting a huge tall fence around our yard to keep him home, but he climbed it...no joke, I watched him do it. He dug under fences too. 5. With cats and dogs being the most popular pets, what is the most exotic pet you have personal experience with (didn't have to be yours)? I dated a guy with a ferret, well actually now that I am thinking about it, I think it was his roommate's, it was super cute and sweet, but they are smelly little things. 6. Please tell us something random about your week so far... We were all hoping for a snow day yesterday and possibly today, but we ended up staying in school all day Tuesday and went to school today (Wednesday) too. We have a baby shower for a co-worker on Thursday and a birthday party for a co-worker on Friday! We love celebrations! Oh my goodness! How awful! I will never forget one night we had been out with my brother-in-law’s family and when we returned, we discovered the dog had killed my niece’s beloved cat! She was heartbroken and I was so shocked. My dogs have always been inside dogs. Dogs will be dogs and if they live outside, they will likely use their hunter instincts to stalk and kill. My cats stay inside and I hope none of them every escape!! Dogs should also be inside pets! I agree! I enjoyed your answers and thank you for joining in today! Have fun at the shower and birthday party! Oh, Lori, my daughter and her husband raise and breed Pembroke Welch Corgi's and have for several years. They have litters in the spring and fall and sell them all over the country. They are such great dogs and, as you know, make the best pets. All of theirs live outside but have plenty of room, out in the country, to romp and roam. Have a great rest of the week! My daughter's in-laws have a big dog that runs wild in their woods. Louie doesn't kill anything, but he LOOOOOVES him some dead stuff. He likes to roll around in it and often brings it home. He is a nice dog, but he stinks like dead stuff and if you pet him, so do you! Corgies are so adorable. I love their little heart butts. Mandy is a beauty! I agree with your opinion about keeping dogs outdoors. I see dogs penned in the summer heat with their water bowl turned upside down and left that way until their people get home from work. I hate it. I'm sorry that Mandy is winding down. It is such a difficult thing to see our pets deteriorate as they age. My rule of thumb for putting them down is if they are suffering. Then I can't make them suffer longer just so I don't have to part with them. Is it about them? or is it about me? I enjoyed your post this morning. Your Coggi is a doll. Hope you fine the time to stop in. Sorry to hear about your dog. It must be hard knowing her time is limited. Thanks for your visit. I have always wanted a corgi! I think they're the cutest. praying your corgi has a long and happy life. Your Mandy look so precious, so endearing. My heart aches for the struggles our fur babies endure. I, too, am praying she has many more days ahead of her! PS - Love your new background and header!